Thyme for Cooking Weekend Menu: Turkey and Vegetable Kebabs, easy recipes. More kebabs before the end of the season: a variation on the traditional with an Asian twist. Do the longer-cooking vegetables on separate skewers so everything is done at the same time. These kebabs have an oriental flavor and are served with Warm Peanut Sauce rather than Yogurt Sauce. Cut turkey into chunks, put into a bowl with the Teriyaki sauce. Stir to coat. Cut pepper in half, then each half into 4 squares. Cut onion into 6 or 8 wedges. Slice zucchini into 1/2" (1.25cm) slices. Add pepper, mushrooms, onions and zucchini to bowl with turkey and stir gently. Let marinate 15 - 60 minutes. 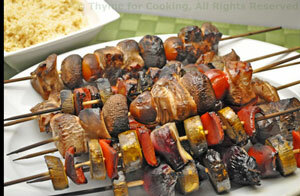 Put turkey, mushrooms and tomatoes onto 4 skewers, alternating. Put peppers, onions and zucchini on the other 4 skewers, alternating. Start to cook the vegetable-only skewers first, over indirect heat with the cover closed. After about 7 minutes, lift cover and turn vegetables, moving over direct heat. Add turkey skewers over direct heat. Cook for 6 - 10 minutes, or until turkey is done. 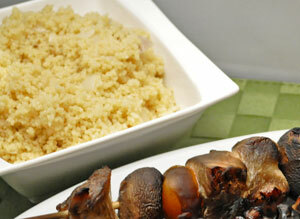 Sesame seeds and oil put a different twist on the standard couscous. Show with Turkey Kebabs. Heat chicken broth and peanut butter to boiling, stirring to combine. Put couscous in a bowl. Uncover, add sesame seeds, sesame oil, fluff gently with a fork to combine and serve.